ORLANDO—This Father-Son event is mellow. If you want a swing tip from Lee Trevino, this is the place to be. If you want to ask David Duval about what it’s like to shoot 59 in a PGA Tour event, get yourself down the Ritz-Carlton course here, get yourself in front of the man and just ask. 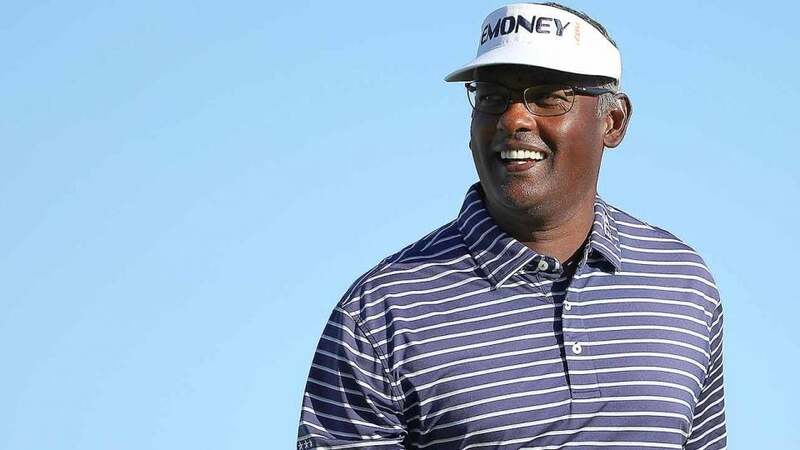 If you want to ask Vijay Singh about the settlement of his long, protracted lawsuit against the Tour, you’re going to have half-a-chance here. Here are five little mellow moments from a Friday visit to the PNC Father/Son Challenge. MM No. 1: Singh, talking amicably about his settlement last month of a nasty piece of litigation with the PGA Tour known in some quarters as the Deer Antler Spray suit: “It was good for both sides, I guess. I’m glad it’s over. It lingered on and on and on and it’s nice to just finally have it behind me. The PGA Tour has always been a great organization. It was just a [PED rule] that didn’t pan out. Everybody knows about it, I’m glad it’s over.” Singh is 55 and he had no problem rattling off his January, February and March schedule because it’s pretty much what it’s always been: “Sony. AT&T. L.A. Honda. Bay Hill. TPC. And then I’ll see what happens.” In other words, regular Tour. Sony is the Hawaiian Open. AT&T is Pebble Beach. Honda is Honda. Bay Hill is the Arnold Palmer event. TPC is the Players Championship. About the only Tour-preferred corporate name Singh missed was Genesis, which is what Tiger Woods calls the annual stop at Riviera, longtime home of the Los Angeles Open. This year, Singh finished seventh and made $1.7 million on the PGA Tour Champions. MM No. 2: After John Daly and his son, Little John, finished their pro-am round today, Little John went to the range and Big John went to lunch, where he ate lunch for the both of them. Little John is 15 and he’s a big kid with astonishing speed through the ball and a swing that looks nothing like his father’s. “It’s wild, isn’t it?” old original John said. “Barely brings it back to parallel, he’s laid off, he’s got that lag move like a Rickie Fowler or a Sergio Garcia. The game I grew up on you played with your wrists. You unhinged it with your wrists, you released it with your wrists. But he’s playing the game you got to play, with the ball and the clubs that they have. I’m still doing it my way, and it’s still working pretty good.” https://twitter.com/SI_Golf/status/1073270399444623361 MM No. 3: Matt Kuchar is playing with his father and long-ago caddie, Peter Kuchar. They were making plans to attend a Saturday-night tournament dinner. “Don’t forget your sport coat,” the father said. “I don’t have a sport coat,” the son said. The father looked mildly anxious. The son looked at the invitation on his cellphone. “It says jacket optional,” the son said, and that was the final word on that subject. “I’ll be by your room at six-thirty,” the father said. MM. No. 4: In separate interviews, Jim Furyk and Matt Kuchar were both asked if they expected to see players leave the flagstick in the hole when making short downhill putts at Augusta this year when a new rule goes into effect in 2019 that allows the flagstick to remain. Both said the same thing: they would have to defer to Bryson DeChambeau and his analysis of whether there is sound science behind such a practice. Furyk said (jokingly) that he would need “to know the coefficient of restitution” of the flagstick in order to answer. Kuchar said, not joking, that if you took that flagstick out you wouldn’t have the back of the hole to absorb the blow of a firmly-struck putt, which he is apt to use. MM No. 5: Jack Nicklaus is playing with his grandson, GT, Gary’s son. GT is the kid who made a hole-in-one in the Wednesday par 3 tournament, taking over for a shot while serving as his grandfather’s caddie at the Masters in April. Big Jack was asked about that ace on Friday and what he said is astounding and is so revealing about Nicklaus. He said: “GT had hit my pitching wedge on the practice range. First time he ever saw it. He had a jumpsuit on, which was pretty tight. He made a beautiful golf swing. Knocked it on the green and into the hole. Gary Player was jumping up and down. Tom Watson was jumping up and down. I think I was crying. He was obviously ecstatic. It was great. I walked down the path and Curtis Strange was in the booth. He looked back at me and said, `How does that rank at the Masters for you?’ And just went like that.” And Nicklaus held up his index finger. No. 1. This from the man who won the Masters six times. “What you do with your own kids or grandkids is far more important than anything I have done, he said. If that doesn’t show the perspective of age, what could?